With the evolving needs of our life, it is inevitable to having to relocate from one place to another. Giant Removalists Western Suburbs Melbourne is focused on making your moving day as stress less as possible. But while you plan the relocation, the most challenging task is to pack, move, and unpack. So for your rescue, we deliver moving and packing serves in Western Suburbs Melbourne city. We will handle the job in a much better way as we have trained professionals to help you in the process. In addition to that, the Giant removalists Western Suburbs Melbourne will also not charge you immensely. What Are Giant Removalists Western Suburbs Melbourne Good At? Reliable– Giant Removalists Western Suburbs Melbourne hires people with civil background and go through stringent character checks before making them a permanent part of our team. The security of our clients is crucial. We ensure that we are sending reliable people at your service. Also, since our professionals are very well versed in their task, you can expect safe packing and removal of your house and office stuff. Responsible– Our team take full responsibility of the work. We start with the packing process and use different kinds of materials to ensure optimum safety of your possessions. removalists Western Suburbs Melbourne are known to deliver most responsible service and we plan to trail our ethics to the longest. Customer Service– In all the hustle and bustle, you sometimes find yourself with lots of questions regarding the service. Well, we are here to discuss all what you need to know. Whether it is about the questions asked before hiring us or after the service is delivered, we are here by your side at every point. After hiring Giant Removalists Western Suburbs Melbourne, you can rest assured as your tasks are handled by the masters of the market. While the Budget Removalists Western Suburbs Melbourne companies will help you at every point but it is for your own good if you have complete knowledge on the kinds of van you require for the moving. Selecting right van for the job of removals is crucial. We make the selection of rightly-sized van for you so that it will not only save your money but also retire you from making multiple rounds to pick up and drop your possessions. This is especially in the case when you have to make interstate relocations. Our cheap removalists Western Suburbs Melbourne Company will guide you in the process and stick with you throughout the moving process. There are different kinds of vans available as per your needs. First you have to determine your needs and then discuss it with the budget removalists Western Suburbs Melbourne. We will always give you suggestions on the kind of vans you will require. The stuff has to be closely packed in the van without leaving much space in it. You can go for 4 ton van, ideal for people living in 1 BHK. Then there is 4.5 ton truck compatible for 2BHK and 3BHK houses. Other than that, there are mini trucks for the smaller removals. Most of the removalists Western Suburbs Melbourne got all kinds of vans. You can discuss it with us and get the right van. The vans can also go up to the capacity of 6 tons and 8 tons. It strictly depends on your needs of which one you require. The price of the vans delivered by movers Western Suburbs Melbourne varies with the size of the van. We are highly skilled people that possess professional skills of moving and removals. Packing in itself is a very competitive task. You have makes space in smaller boxes and adjust all the things. Giant cheap affordable Western Suburbs Melbourne understand how to make space in smaller boxes. Also, our professionals come with years of experience so the professionals are reliable and well-versed. Moving in itself is too stressful and you can always avoid the tension of packing and moving. If you hire Removalists Western Suburbs Melbourne then your task is just to stand watch the professionals doing their job. You can also give them guidelines that you want the professionals to follow. You can always buy the packaged deals from us if you want everything regarding moving covered. But if you are comfortable by hiring partial services then you can always go for the solo services. Basically, the discount movers Western Suburbs Melbourne can get you tailored services as per your requirements. So these are some common benefits can make you seek towards our company. Giant movers Western Suburbs Melbourne can help you in great ways and trust us; you direly need these services if you are planning to move. Different companies offer different kinds of removal services. We, the Cheap Removalist Western Suburbs Melbourne offer packing house stuff, smaller contents, furniture, large musical instruments, boxing the stuff, arranging the van, moving the stuff, unpacking it, arranging it. You may not get all the services in pre-baked services at the website. But whatever services are available in the catalogue can be compiled in a plan. Normally, different packages offered by Cheap Removalist Western Suburbs Melbourne contain services such as packing, boxing, and moving. Cheap Furniture Removalists – The Giant Cheap Removalist Western Suburbs Melbourne provide furniture moving services. Our professionals take full responsibility of the furniture items, and safely drop them to the destination. Packing and Unpack – Once you reach the destination, the Giant cheap movers Western Suburbs Melbourne help the customers in unloading, and unpacking and arranging the stuff. You can avail further services of getting the stuff arranged in the new house as well. This will cut your efforts to a great extent in the new location. Why To With Giant Removals Western Suburbs Melbourne? 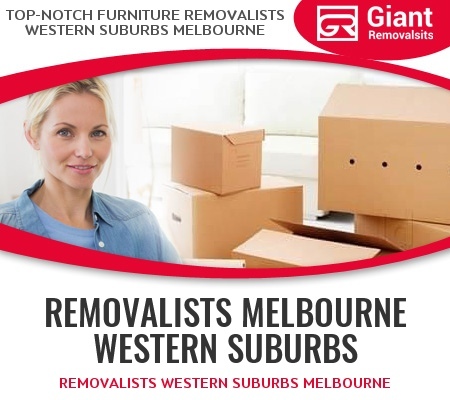 Giant Removals Western Suburbs Melbourne has been moving the houses, furniture, offices, pianos, pool tables, etc. for a long time. We have got the work force that has explicit skills in packing and moving. The Western Suburbs Melbourne removalists are immensely honest and hard working. We have a very cooperative group of people who understand your needs and give you best value of money. We suggest you the right services after understanding your needs. Giant Removals Western Suburbs Melbourne’s USP is that we don’t just suggest the services to increase the bill. We want to build confidence and trust among customers and that is why it is important for us to guide our customers’ right. While we sit with our customers, we plan and make suitable suggestions. Western Suburbs Melbourne movers also encourage the customers to give us all the taxing tasks and focus their energy on other things. We understand that you have many other important things to focus on so we can gladly take up all the moving related tasks. Removalists Western Suburbs Melbourne not only summarize their services till completing the task. We are always available for our clients for the after-sale customer services and gladly answer all the concerns of our customers.